Choosing the right cabinetry for your kitchen can be difficult if you’re not sure what different types are available. Before starting your kitchen remodel, you should have a budget in mind which should include cabinetry, appliances, fixtures, and installation. The costs of the cabinets can vary as to the type of cabinet. There are three types of cabinets, stock, semi-custom and custom. Stock cabinets are the least expensive as they are produced in large quantities in standard sizes such as a wall cabinet 24” wide by 30” tall or a base cabinet 30” wide. They cannot be altered in width, depth or height. In designing with these cabinets, fillers are used to fill in the few inches needed to accommodate the kitchen dimensions. There are limited door style and stains. If your budget is more important than the design then this is your choice. Semi-custom cabinets come in standard sizes and most can be modified as to height, depth and width with more flexibility in design. Some specialty cabinets are offered such as recycling trash cabinets and pull out trays. You have many more choices as to door styles, color and finishes. The cost is between stock and custom cabinets. 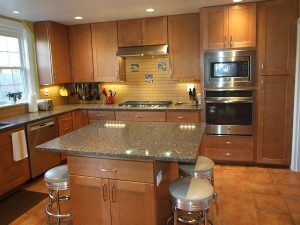 Custom cabinets are made to order and everything from dimensions, styles, materials and finishes are entirely customized. The design can be very elegant to very modern with many specialized cabinetry options. Due to the endless design options, these luxury cabinets are very expensive. Frameless contemporary cabinets can often be ideal for more modern homes. There are two type of manufactured cabinets that you can choose, framed or frameless. The framed cabinet has a frame usually 1/1/2” thick to give the wall cabinet stability and ensure that the doors and drawers align symmetrically. The doors can be recessed, full overlay or inset. The come in many door styles from traditional to transitional. 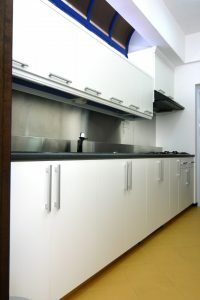 Frameless cabinets are more European style and the doors and drawers are connected directly to the body of the cabinet creating an end to end appearance of walls and base cabinets. They are very trendy and can be found in contemporary or modern kitchens. Cabinets account for 30-40% of your project and with the help of a kitchen professional you can select the right cabinet for your project. This entry was posted on Tuesday, May 15th, 2018 at 10:46 am. Both comments and pings are currently closed.